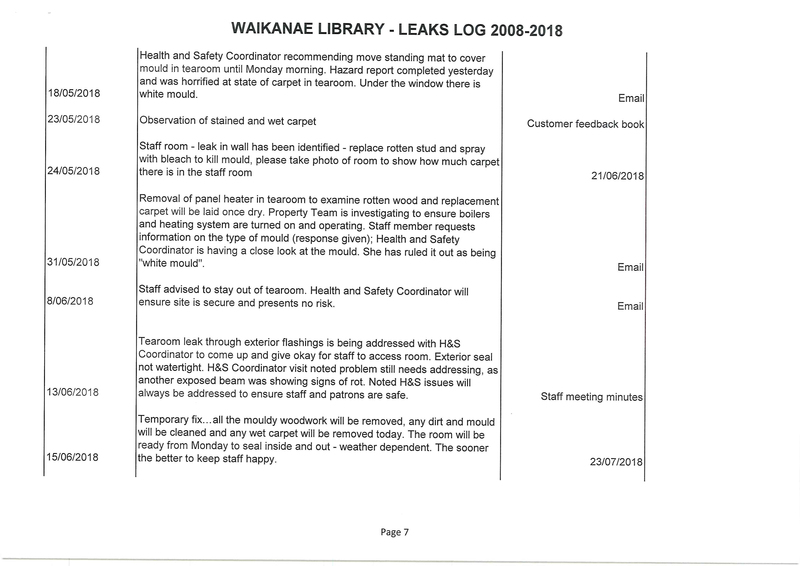 As everyone knows, the Waikanae library was closed last November after a test for toxic mould revealed its presence. That was four months after its staff complained of asthma — according to an entry on page 8 above. 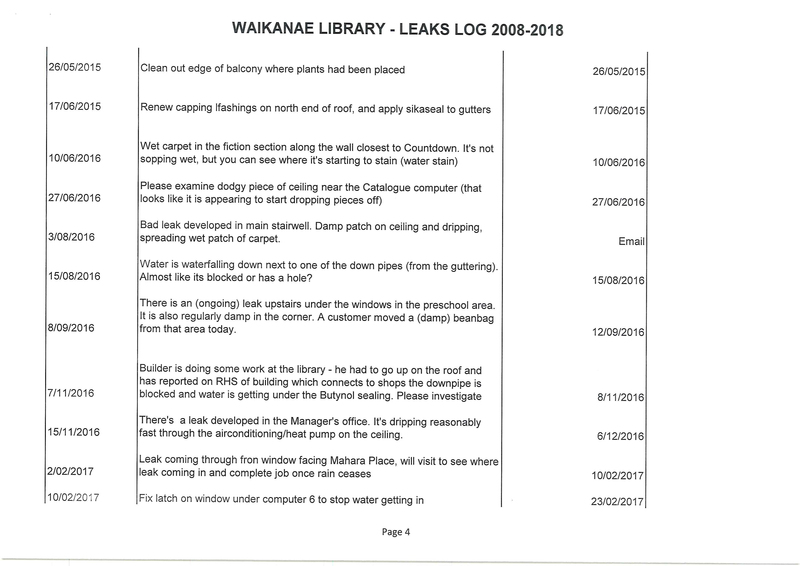 The log of leak reports we requested from the council for the past 10 years is shown above, and speaks for itself. The mention of 2002 in the Stuff article came during a conversation between the Stuff reporter and James Jefferson, Group Manager, Place and Space of the KCDC, the latter tells us. 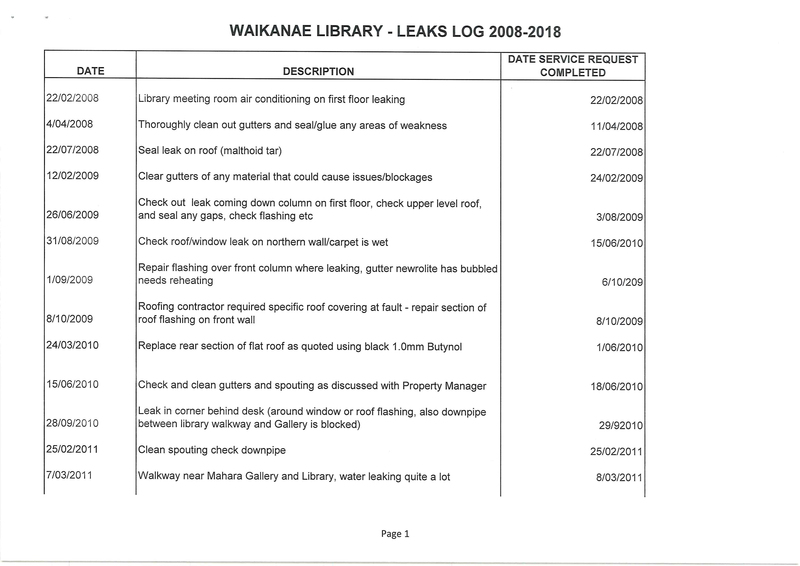 Mr Jefferson is unable to answer why the library wasn’t tested before November 2018, 16 years after the first indication of leak issues. In the Stuff article he is reported as saying the repair bill could have been reduced if council had acted earlier, but was unable to confirm if any of the costs would be covered by insurance. Well, we can answer that for you, Mr Jefferson — it won’t be. The council should at least be relieved about that. However, its negligent endangering of both library staff and users is simply not acceptable. Whether 62 can be considered old is beside the point: the library had a lot of senior users. In its media release of 28 November the council’s Group Manager Regulatory Services, Natasha Tod, claimed “…we take seriously any potential risk to the health of our staff and customers.” Er, yeah, right… She went on to say the test results showed that two types of mould were present that were of concern: one is non-toxic but has the potential to cause hay fever-like symptoms, the other is Stachybotrys which is toxic. Move it to different (semi-)permanent premises? It can’t stay in the Mahara Gallery. Advance the proposal for a completely new building? This cost will be a lot more. 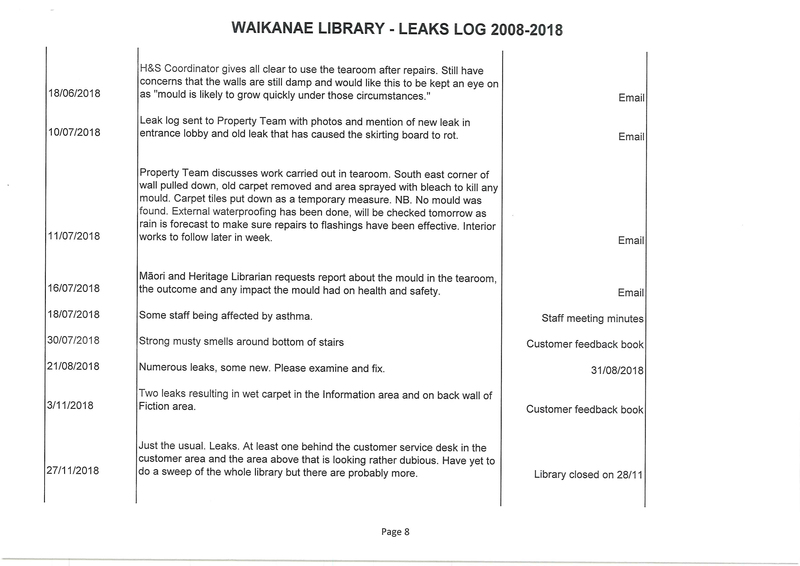 Do nothing and have no Waikanae branch library? Libraries are considered to be central community hubs with roles beyond simply lending out books. The retailers around the town centre certainly want the library. As stated on 6 December, these are the considerations that need to be talked about by Waikanae people; the options should be presented to them for decision in a referendum.